There are people for whom procrastination is a disturbance in life. Procrastination can influence a person’s social status, affecting their financial situation negatively. In addition, procrastinators are not able to change their behavioral schemes – putting things off for later. This is how the vicious circle of stress and procrastination keeps on turning. How does it work? Thinking about a task that you somehow do not want or cannot perform gives rise to serious concern. Procrastination gives relief for some time, but the thought of the work you put off lingers at the back of your mind and does not allow you to rest. The consequences of discontinued work, which may await you in the future, can only make things worse. Continuous pressure quickly affects your health – irritability, inattention, headaches, insomnia – these are only some of the effects of delaying tasks. The situation is even more serious if procrastination occurs from having ADHD, neurosis or depression. Can ADHD be the cause of procrastination? People struggling with ADHD have problems with planning their activities, concentrating and performing complex or tedious tasks. That is why they are quickly irritated, tend to forget about different, even day-to-day matters, and is difficult for them to keep track of important dates. The disadvantages arising from ADHD can contribute to procrastination. Cognitive behavioral therapy might help. It makes it easier to eliminate erroneous and introduce correct behavior that facilitates better time management. Anxiety neurosis may be another reason for putting things away. Persons who suffer from it experience continuous restlessness. The worry about their own health, security and family, occupies a lot of their time and there is not much left to perform other activities. This also contributes to procrastination. How to make sure that neurosis is the cause of it? The disorder is manifested by fatigue, insomnia, irritability, tension, cardiac arrhythmia and excessive perspiration. Medication and psychotherapy might help treat neurosis. Besides, it is also worth trying to distract one’s mind from negative thoughts. Depression is a very serious condition in which the brain ceases to function rationally due to chemical changes occurring within it. A depressed person is low-spirited, overtaken with sadness and a sense of hopelessness. The characteristic trait is the unwillingness and lack of energy and capacity to carry out even the most basic operations. For friends and family, who have not dealt with depression before; such behavior might be completely incomprehensible. It is often perceived as apathy or laziness. Sometimes people react to depression by saying “Get yourself together!”. However, depression should not be neglected, especially as its advanced stage can lead to suicide. It is necessary to consult a psychiatrist and start treatment methods, which usually are based on taking medications, sometimes also undergoing individual sessions with a psychotherapist or group therapy. Obsessive – compulsive disorder is closely related to depression and neurosis. This type of dysfunction does not allow you to feel satisfied with your own task even if they have performed well. This is a feeling slightly similar to excessive perfectionism. There is always something to improve; nothing is perfect as it should be. A person with obsessive – compulsive disorder accumulates negative feelings and thoughts, which is accompanied by a sense of helplessness, negative thoughts, and repetitive reflex operations (e.g. cleaning, stacking or swapping objects, washing hands or teeth, etc.). All this confines the person and does not allow them to deal with matters that should be performed. These disorders are treated similarly to neurosis and depression – by taking medication, conducting cognitive-behavioral therapy and group work, etc. The lack of sleep, an abundance of tasks, responsibilities and stress in the short term cause serious strain to a person’s health. Symptoms of fatigue include drifting off in the middle of the day and in unexpected circumstances, irritability, insomnia, lack of energy and problems with attention. This condition also results in procrastination. Fatigue is seemingly less serious than the previously mentioned dysfunctions, but neglecting it may lead to severe consequences: autoimmune diseases (diabetes mellitus, Hashimoto, systemic lupus erythematosus, rheumatoid arthritis, etc. ), myocardial infarction, atherosclerosis, depression. Sometimes, to avoid fatigue, it is sufficient to learn assertiveness and delegate tasks to other people. Furthermore, during increased exploitation of the body it is worth ensuring comfort and the possibility to regenerate – maintain a healthy and balanced diet, exercise and ensure a sufficient quantity of sleep. 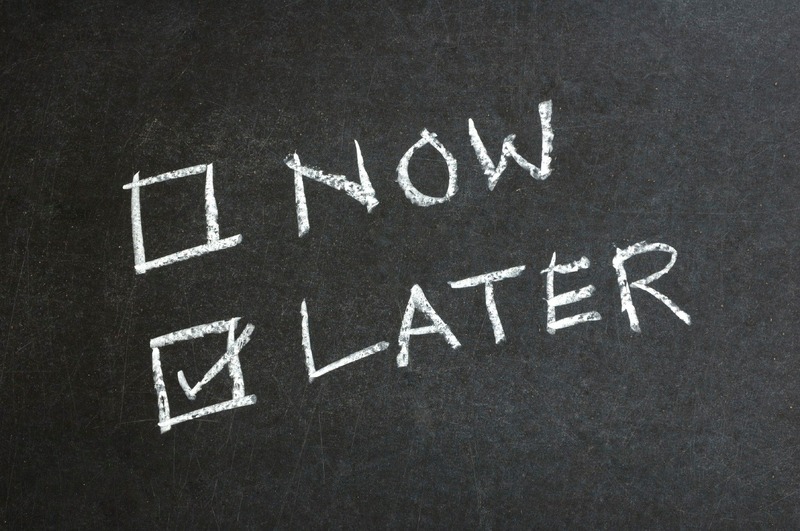 It is of utmost importance to raise and answer the question – why do I procrastinate and put things off for later? What kind of things am I putting off? What deters me from them? Do I have time for performing important tasks? Maybe there is another reason why I do not want to do them? If procrastination results from a lack of willingness and does not relate to other types of disorders, you can motivate yourself by dividing your tasks into smaller and more manageable tasks, and learn how to manage time as well as reduce time-consumers such as TV, phones, computer games, etc. If procrastination results from the above-mentioned disorders, it is worth seeking help from a doctor or a therapist. Neglecting such problems will surely not help, but might enhance negative health symptoms.